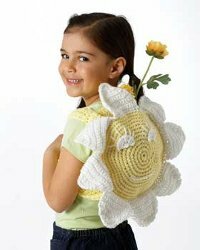 Use a free crochet pattern from Bernat Yarns to make this fun smiling sunflower bag for your little girl. Send her off to school this spring in style. It's sure to put a smile on anyone's face. 13 sc and 15 rows = 4 ins [10 cm]. FRONT and BACK (make alike). 1st rnd: 8 sc in 2nd ch from hook. Join with sl st to first sc. 2nd rnd: Ch 1. 2 sc in each sc around. Join with sl st to first sc. 16 sc. 3rd rnd: Ch 1. *1 sc in next sc. 2 sc in next sc. Rep from * around. Join with sl st to first sc. 24 sc. 4th rnd: Ch 1. *1 sc in each of next 2 sc. 2 sc in next sc. Rep from * around. Join with sl st to first sc. 32 sc. 5th rnd: Ch 1. *1 sc in each of next 3 sc. 2 sc in next sc. Rep from * around. Join with sl st to first sc. 40 sc. Cont in same manner, inc 8 sts every rnd to 88 sc. Next rnd: Ch 1. 1 sc in each sc around. Join with sl st to first sc. Fasten off. 1st row: (RS). 1 sc in 2nd ch from hook. 1 sc in each sc to end of ch. 6 sc. Turn. Rep last row until work from beg measures 22 ins [56 cm], ending with a WS row. Fasten off. Pin Gusset to Front and Back, having top opening approx 4 ins [10 cm] wide. To join Back and Gusset: Join MC with sl st to beg of Gusset. Ch 1. Working through both thicknesses (where appropriate), work 1 rnd of sc. Join with sl st to first sc. Fasten off. First Petal: 1st row: Ch 1. 1 sc in same sp as last sl st. 1 sc in each of next 10 sc. Turn. Leave rem sts unworked. 11 sc. **2nd row: Ch 1. 1 sc in first sc. (2 sc in next sc. 1 sc in each of next 3 sc) twice. 2 sc in next sc. 1 sc in last sc. 14 sc. Turn. 3rd to 6th rows: Ch 1. 1 sc in each sc to end of row. Turn. 7th row: Ch 1. 1 sc in first sc. Draw up a loop in each of next 2 sts. Yoh and draw through all 3 loops on hook – sc2tog made. 1 sc in each sc to last 3 sts. Sc2tog over next 2 sts. 1 sc in last sc. Turn. Rep last row 3 times more. 6 sts. Second to Eighth Petals: With RS of work facing, join A with sl st to next missed sc of joining rnd. Ch 1. 1 sc in same sp as last sl st. 1 sc in each of next 10 sc. Turn. Leave rem sts unworked. 11 sc. Work from ** to ** as given for First Petal. 1st row: 4 sc in 2nd ch from hook. Turn. 2nd row: Ch 1. 2 sc in each sc across. 8 sc. Turn. 3rd row: Ch 1. *1 sc in next sc. 2 sc in next sc. Rep from * to end of row. Fasten off. 1st row: (RS). 1 hdc in 3rd ch from hook and each ch to end of ch. 47 sts. Turn. 2nd row: Ch 2 (does not count as st). 1 hdc in each hdc to end of row. Turn. Rep last row twice more. Fasten off. Sew straps to Back of Bag. Sew eyes in position. With A, embroider eyelashes and mouth with stem st as shown in picture. Note: For other fantastic and quirky crochet patterns, be sure to check out our collection of 10 Unusual, Unforgettable, and Unique Crochet Patterns! This is an adorable little bag. I know a few little girls who would love this. It would also be a great addition to craft sales. The instructions for the sewing on the straps are very minimal. I am assuming we just sew one on either side of the back side of the flower, maybe a few inches from the edge? Would have liked a little more instructions on putting straps on. I guess I will have to wing it. I love this bag!!!! 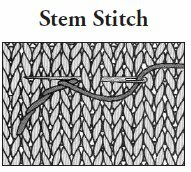 Is there a way to get a picture or a pattern for putting this together?